Still working on the ’57 to wrap up the week. 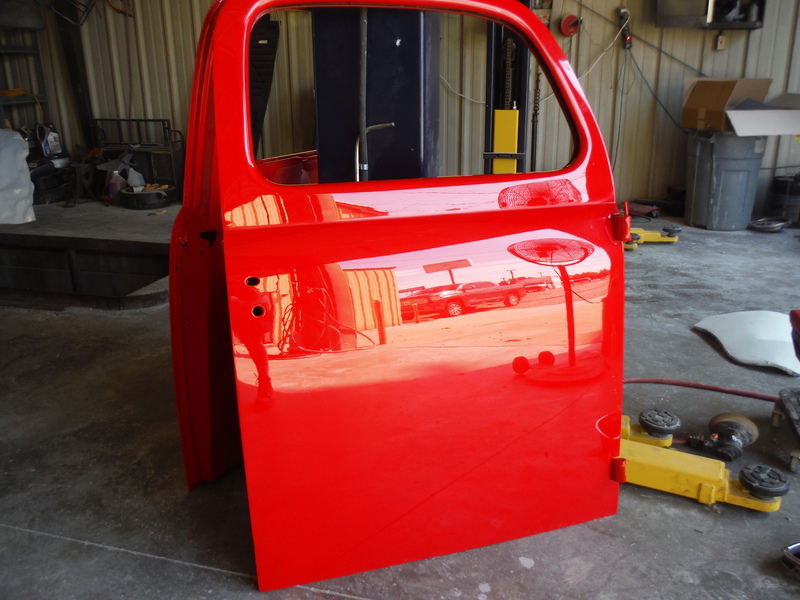 Today we were able to get the doors and deck lid sanded down for buffing. 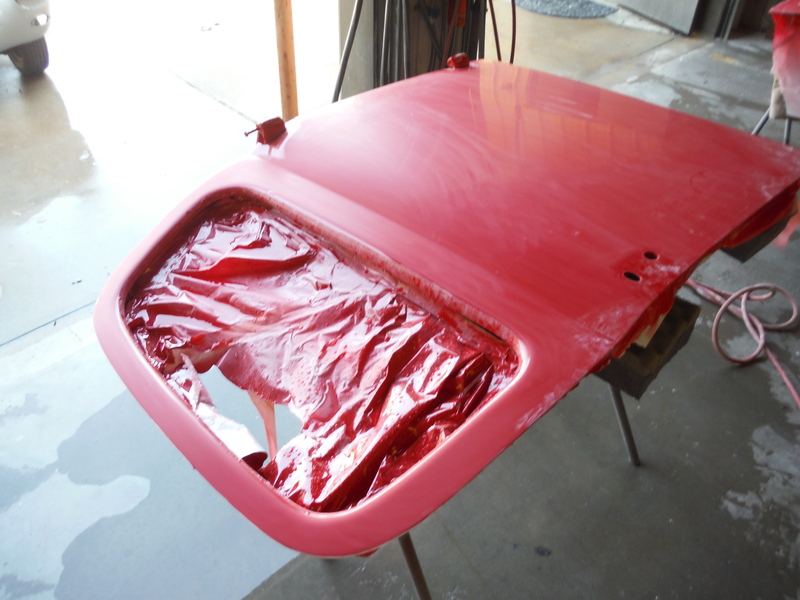 Jordan started on the deck lid then moved to the doors. Paul couldn’t resist the fun and quickly helped Jordan out. 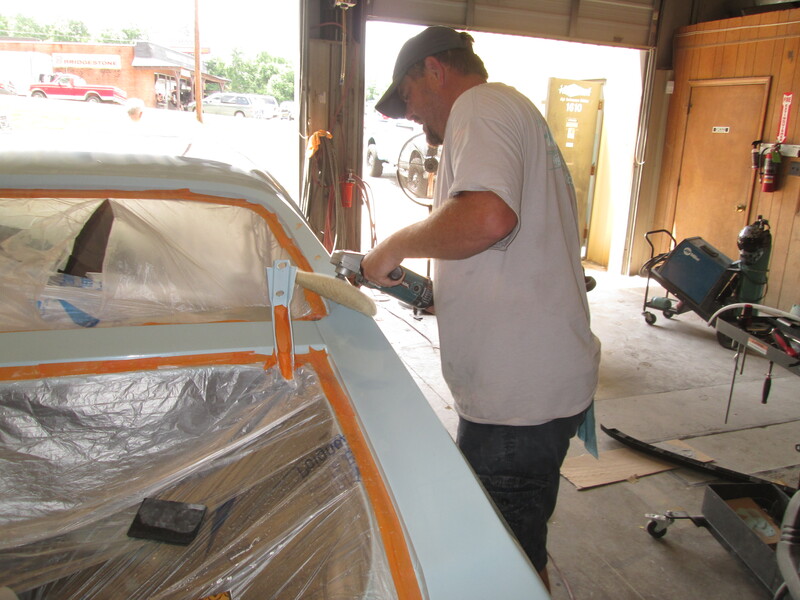 Once they had the truck ready, Paul started the buffing process while Jordan sanded the doors. 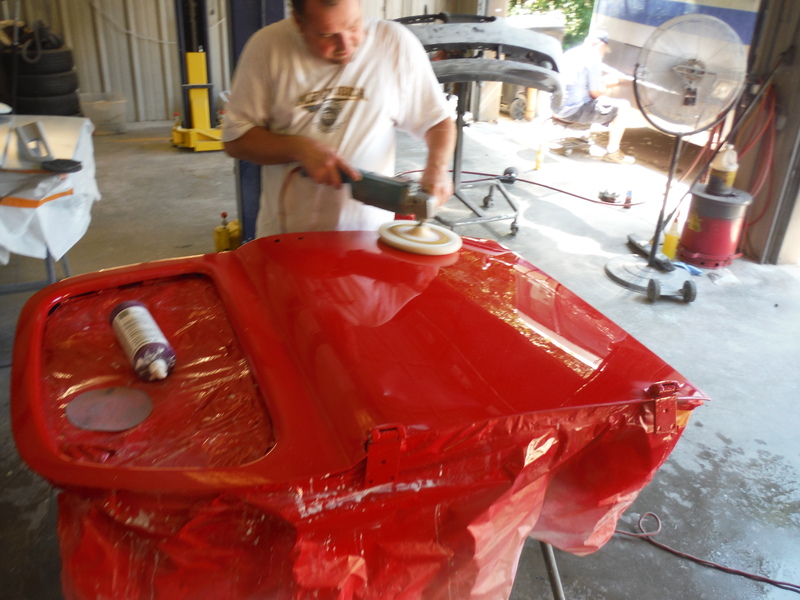 Just like the sanding process, the buffing process consists of 3 steps. First step is a cutting compound. 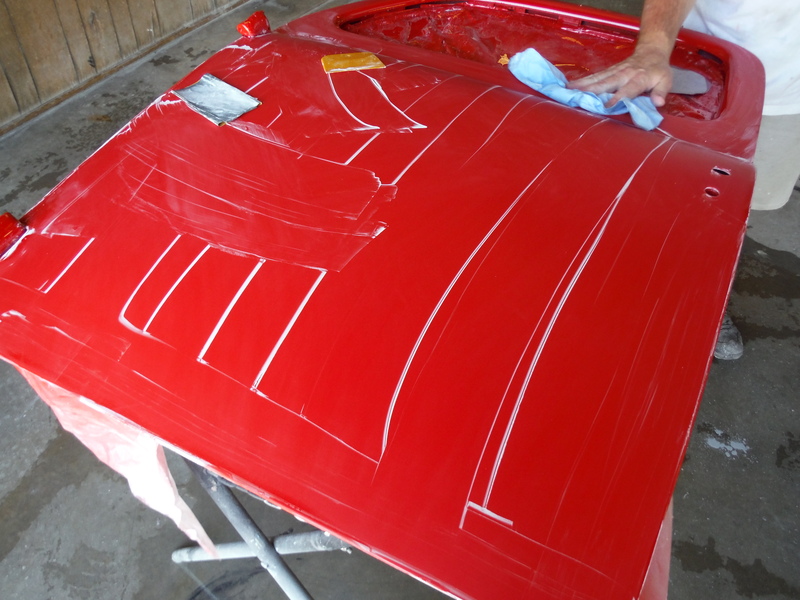 This process removes the sanding scratches but leaves its on scratches from the process. 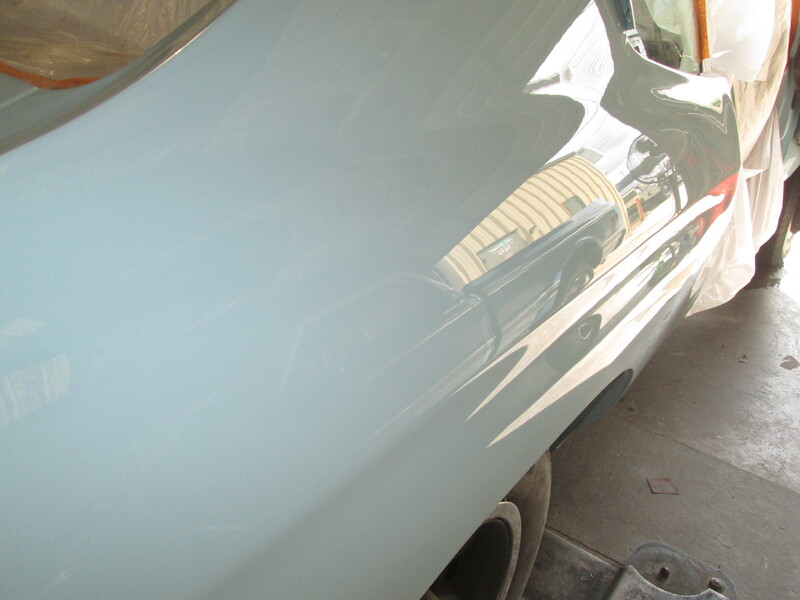 The next step is a polishing compound that removes the scratches left by the first, but it too leaves really fine swirl marks. 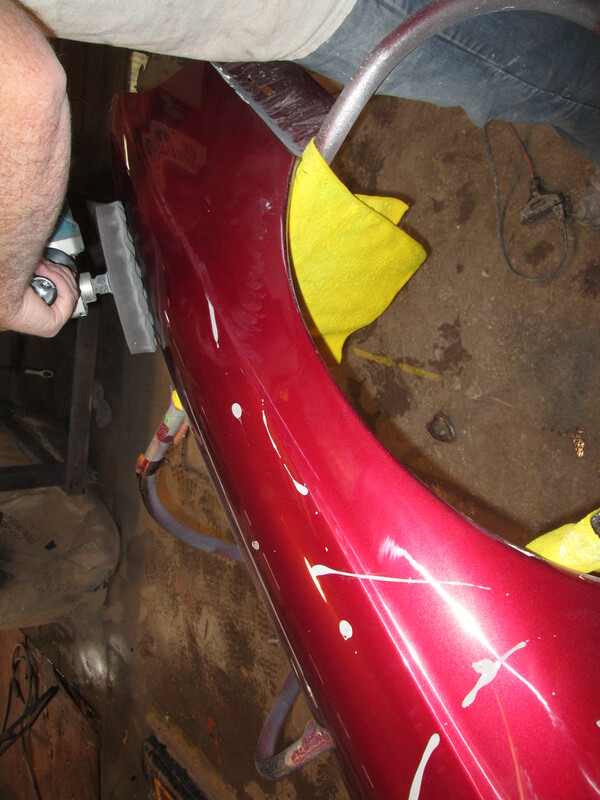 The final step removes the really fine swirls and leaves the paint super smooth and scratch free. Its a long process but very worth it when only the best will do. 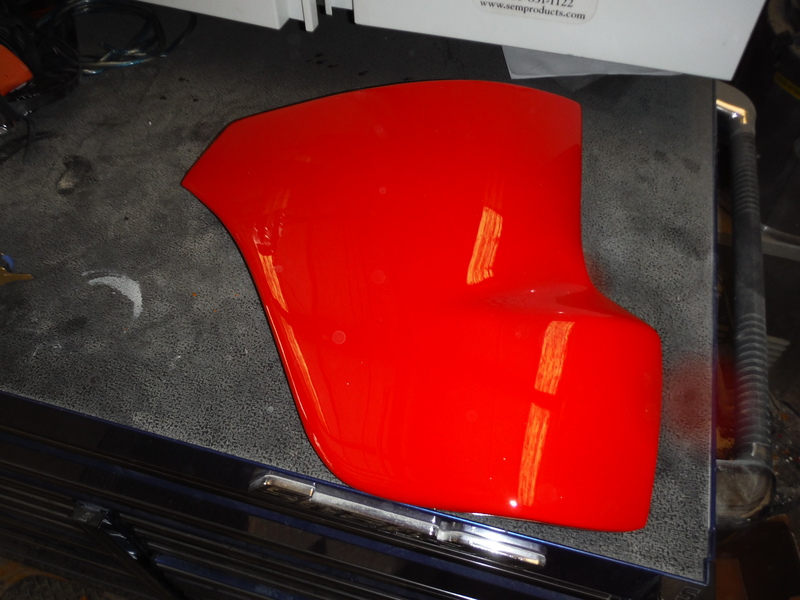 We didnt quite get done with the buffing, but the last picture shows what the paint looks like after one round of step 2. Yes, sometimes you have to go over it a few times to get it right but its worth it in the end. Yesterday started off with a little sand blasting. 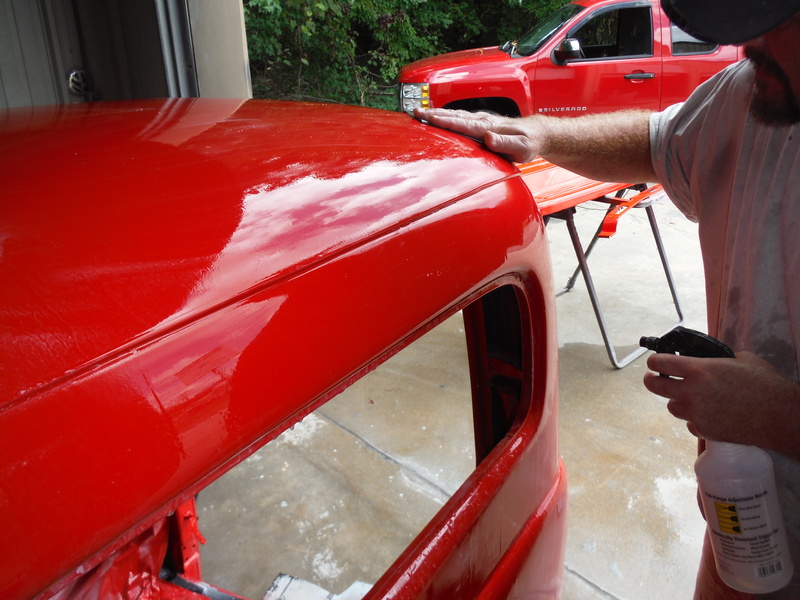 Jordan blasted the hood hinges and the door hinges for the ’57 Chevy. Once they were done, Cole took his turn sanding them back down smooth. 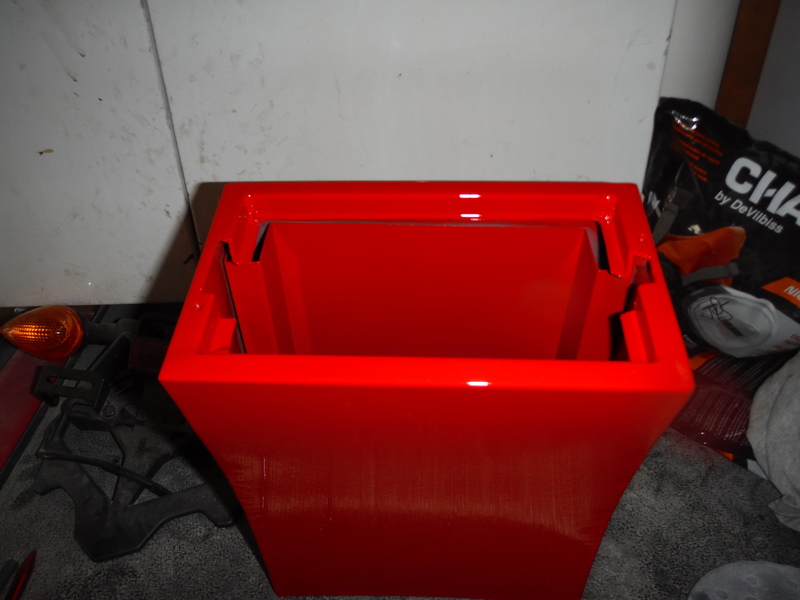 Once that was finished up, Paul cleaned them up and sprayed a coat of DP epoxy on them and followed that with the appropriate colors for the parts. 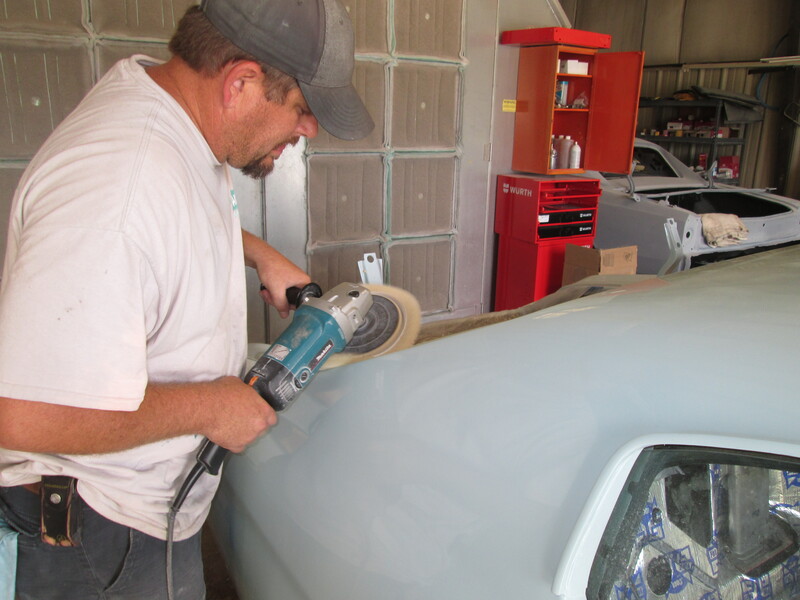 The hood hinges were painted a soft silver color with a flat clear coat and the door hinges were painted the factory Tropical Turquoise then cleared with a high gloss clear. Today we started the wet sanding process. 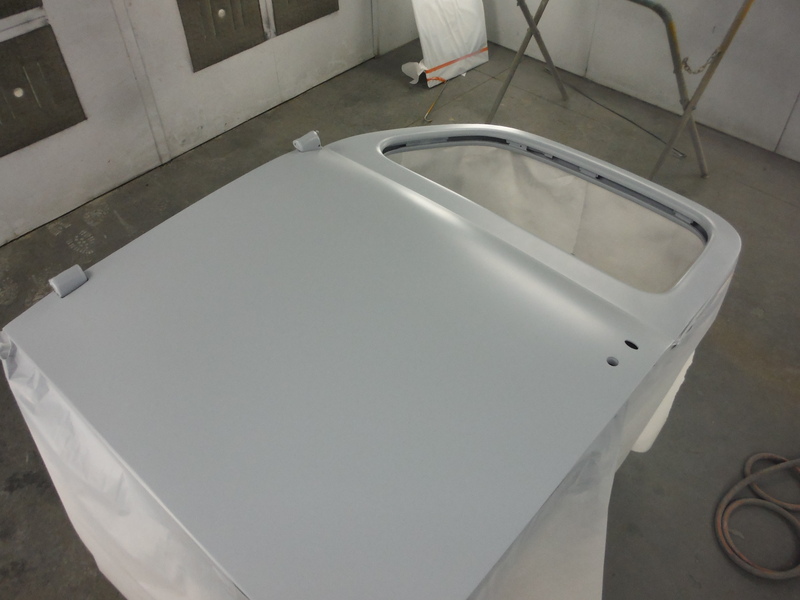 This part of the paint job separates the men from the boys. This is where the super smooth, mirror like finish comes from. 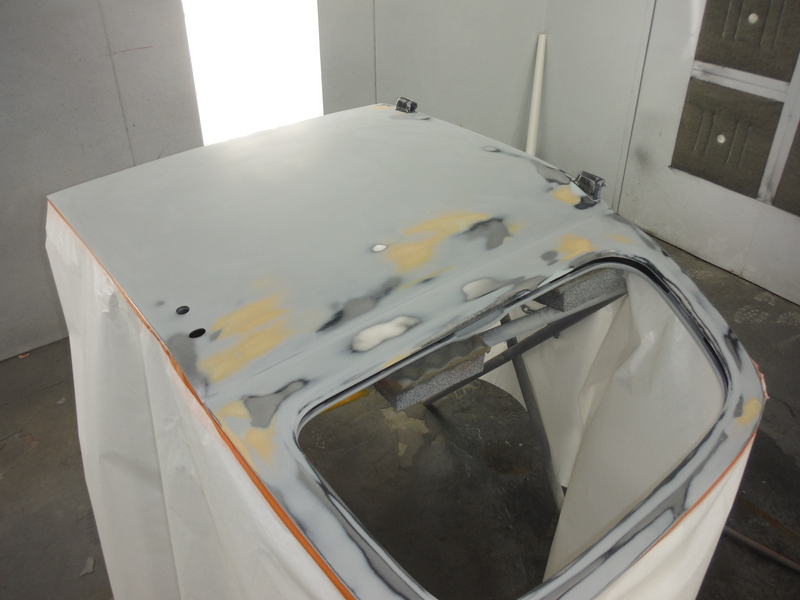 Jordan started with 1000 grit sand paper and carefully sanded the clear coat to remove what little orange peel was there. He then went back over that with 2000 grit paper and followed that will 3000. 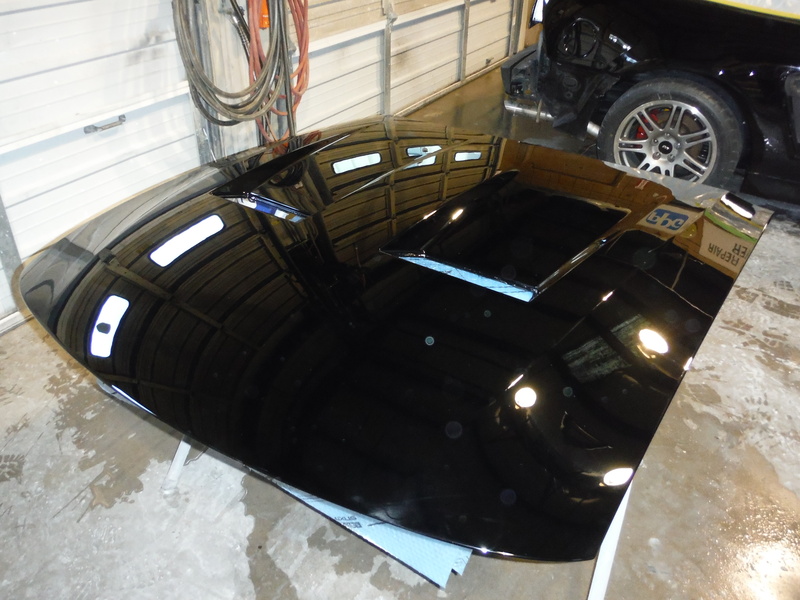 This process will provide a super high gloss and an ultra flat surface. You will easily be able to shave using this paint as a mirror. This Solstice came in today to get a couple of small dents repaired. As you can see, there wasnt much to them. 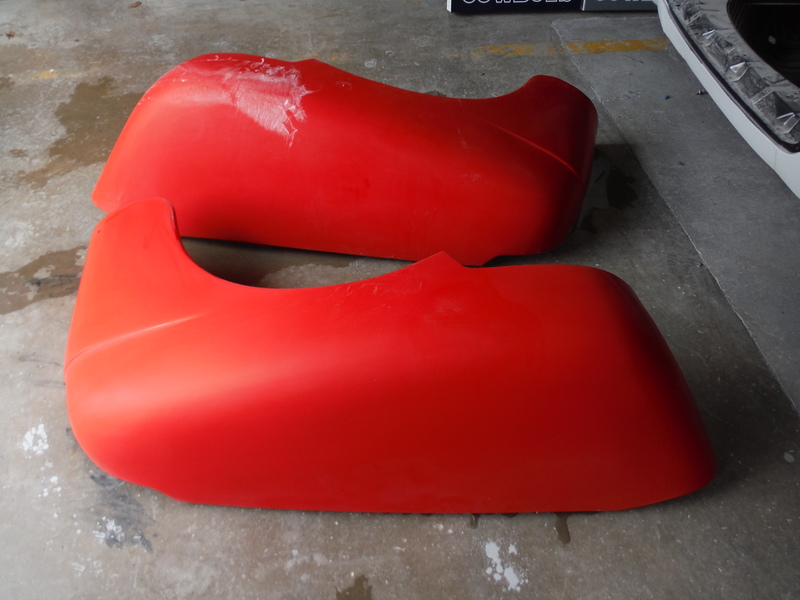 We repaired them today ans got them in primer. Tomorrow this one will go in the booth to get painted. The owner has then requested it be buffed and detailed inside and out. This will be in tip top shape by the end of the week. 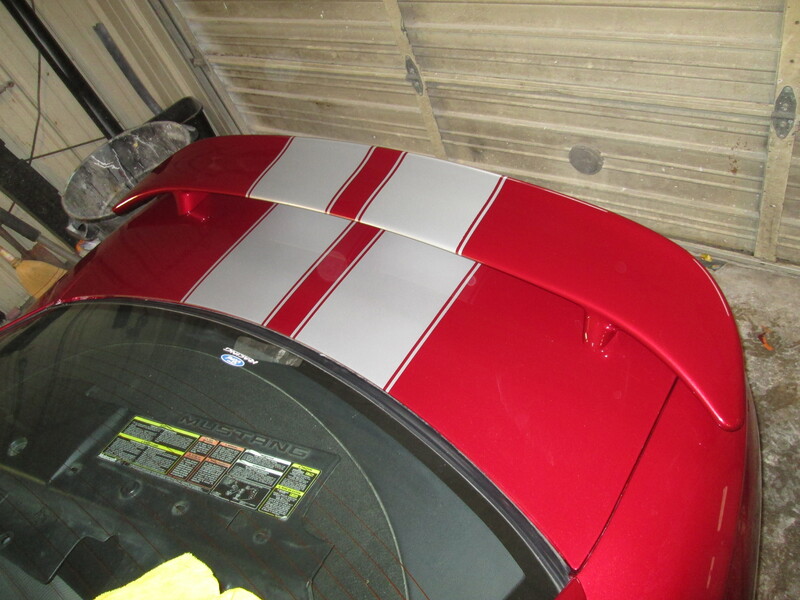 Here is a little teaser of how the Cobra is coming. 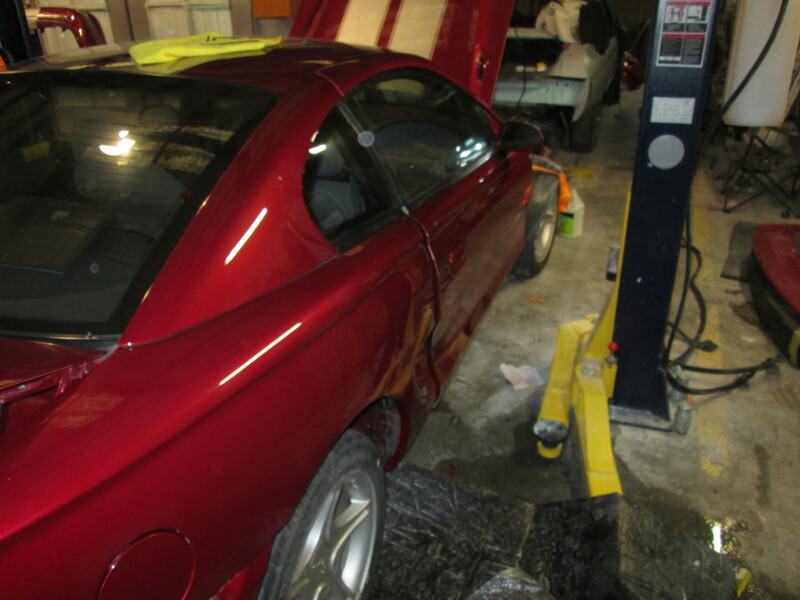 We have been buffing this one for the past two days and we have just about got it wrapped up. We still have to put a final polishing on it and re-assemble it. More progress on code red today. 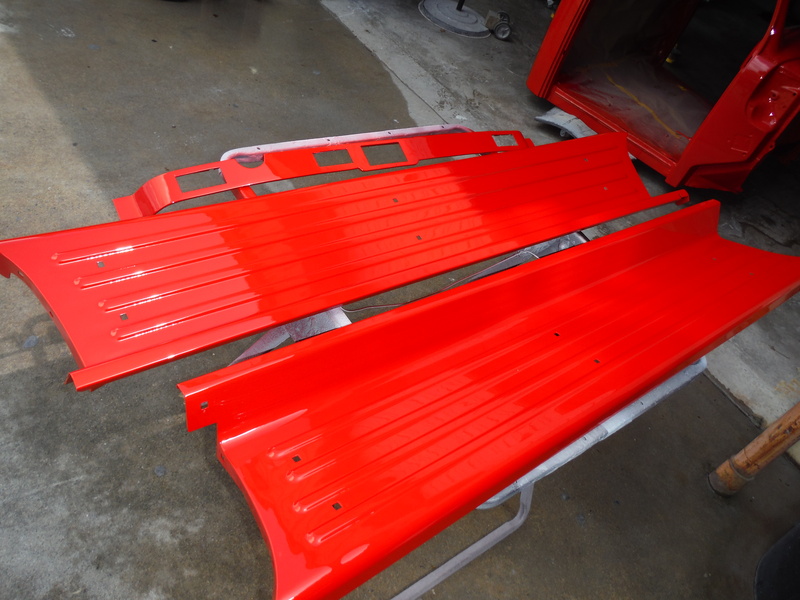 The running boards, lower dash and a fender extension were all painted today. 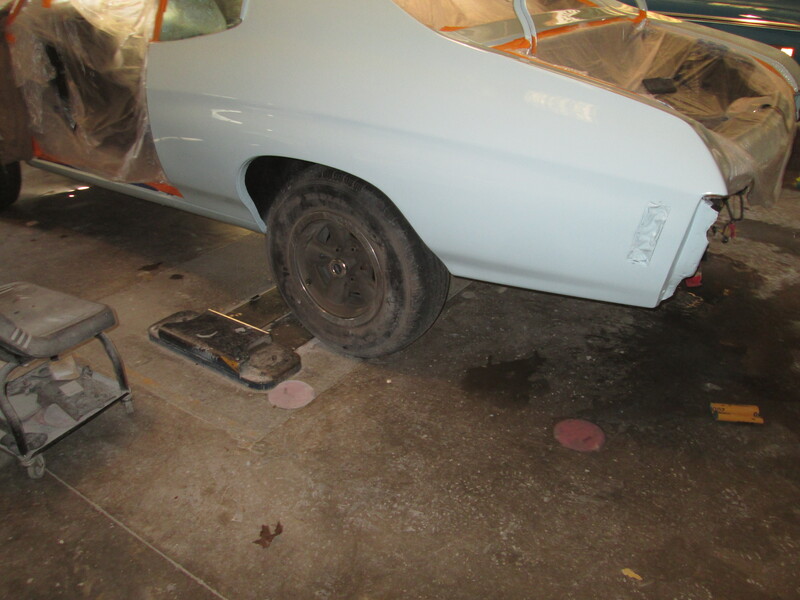 While Paul was spraying these, Chris and I was sanding the fenders and cab in preparation for buffing. 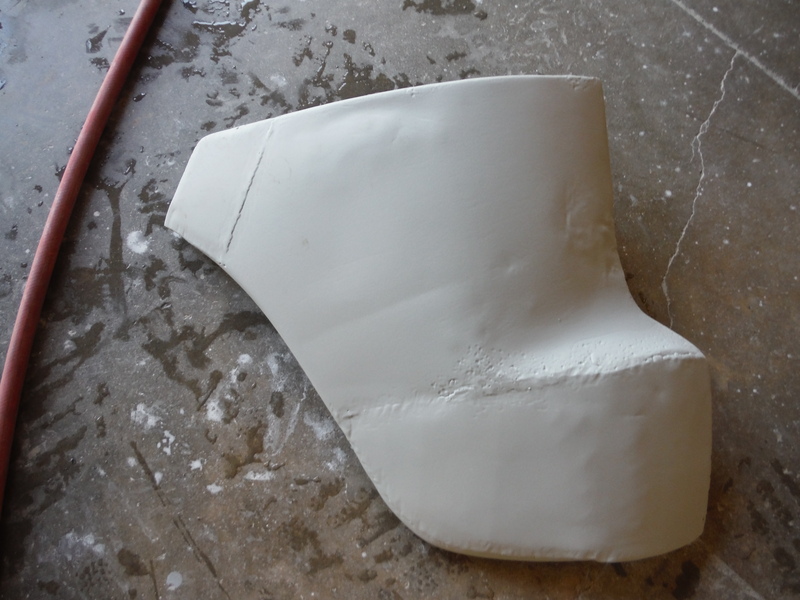 We started off by sanding the parts with 1000 grit to remove the slight peel. This is where the looks like glass comes from. After the we sand with 1000, we switch to 2000 and sand it by hand again. Once that was completed we sand it a third time with 3000 grit but on a DA sander. 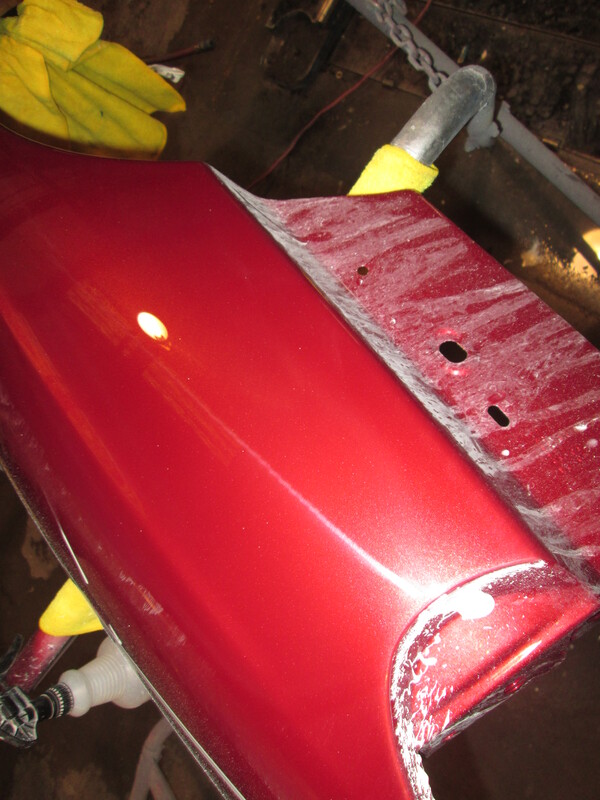 This process makes buffing a little easier and really makes for a nice finished product. 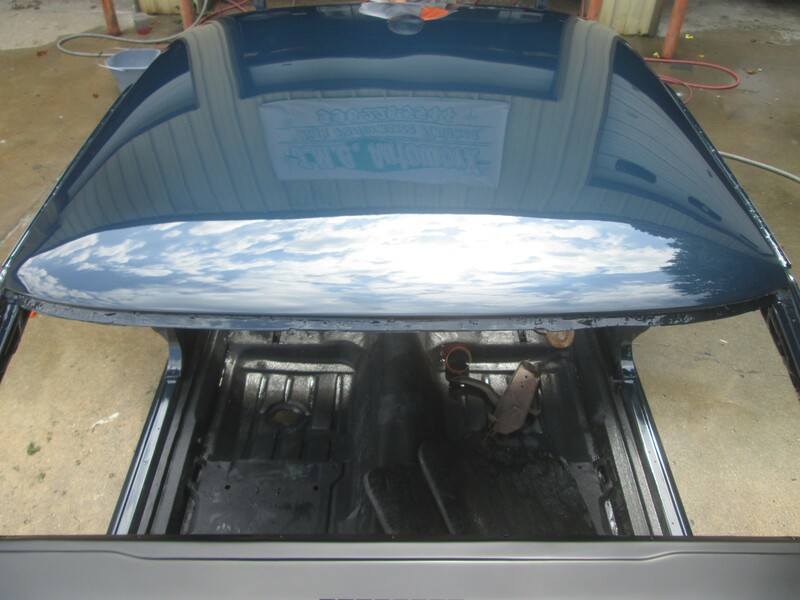 We will start buffing these out tomorrow and should get it done and all cleaned and polished up. 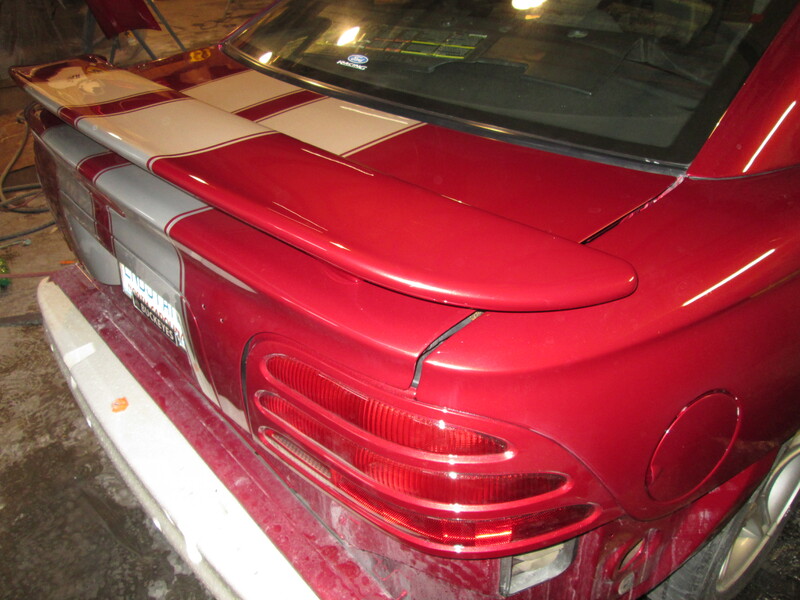 Here you can see what a few hours of wet sanding and buffing can do. 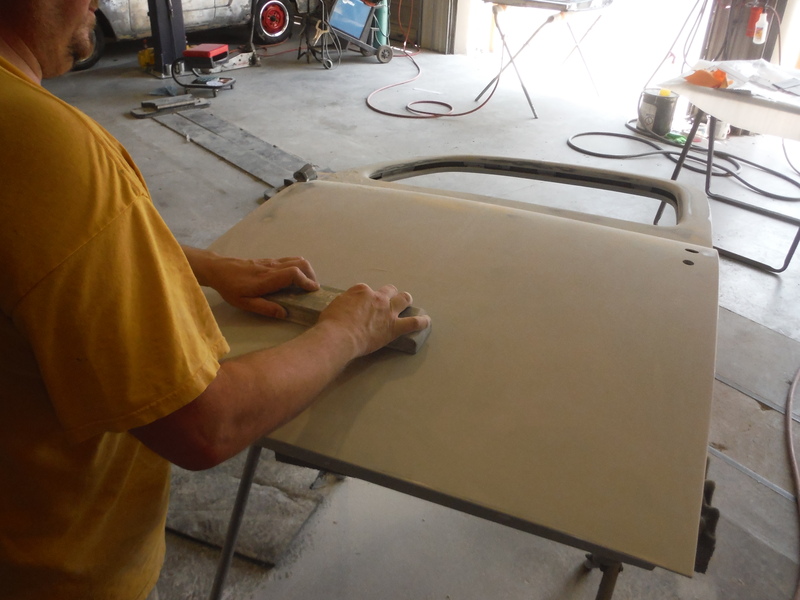 We started out by sanding the doors of the ’52 with 1000 grit sand paper. 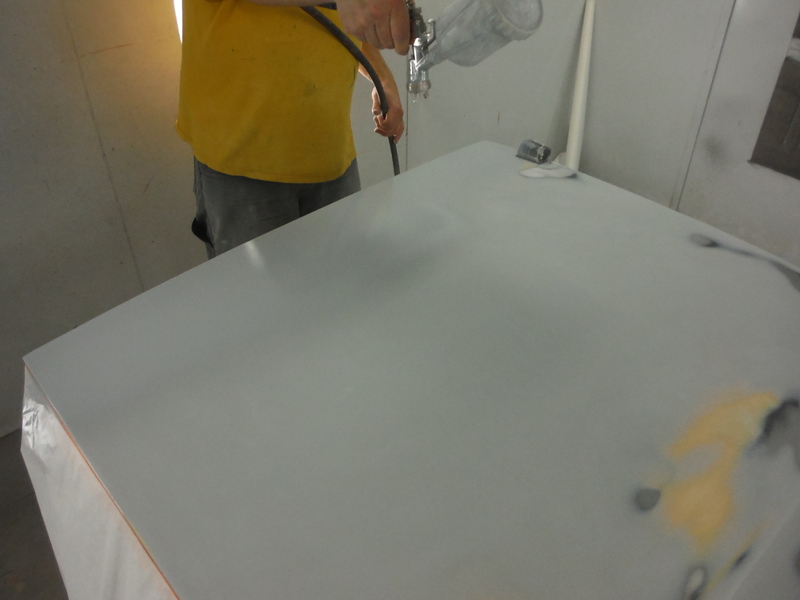 Once we were happy with the smoothness of the clear with that, we switched to 2000 grit sand paper, then finally 3000. The 3000 grit paper makes the buffing stages go quite a bit quicker. Once we were finished with the sanding Paul took over the buffing stages from here on out. He started with a heavy cutting compound, the switched to a light cut before finally going over it with a polishing compound. As you can see, they came out nice and slick. 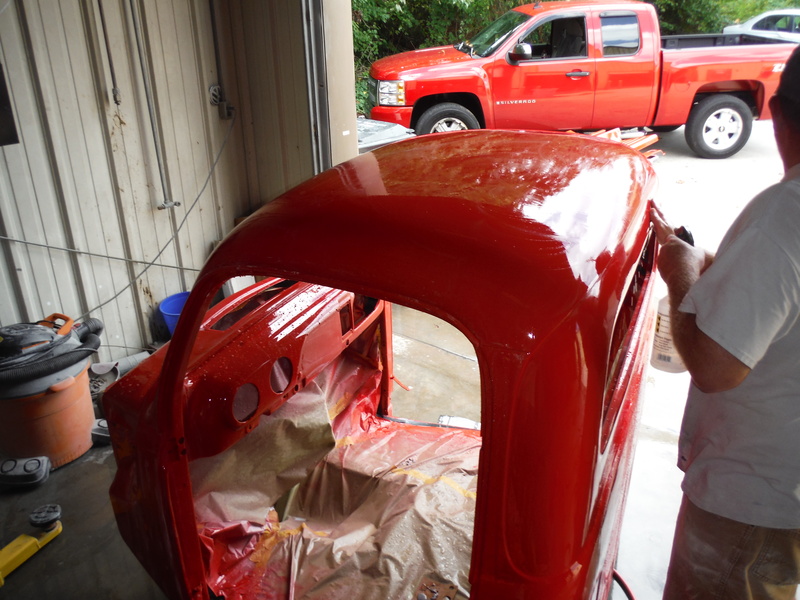 Worked on the ’52 Ford truck today. We were able to get the slick sand all blocked out on the left door. Once that was done, it looked really nice. 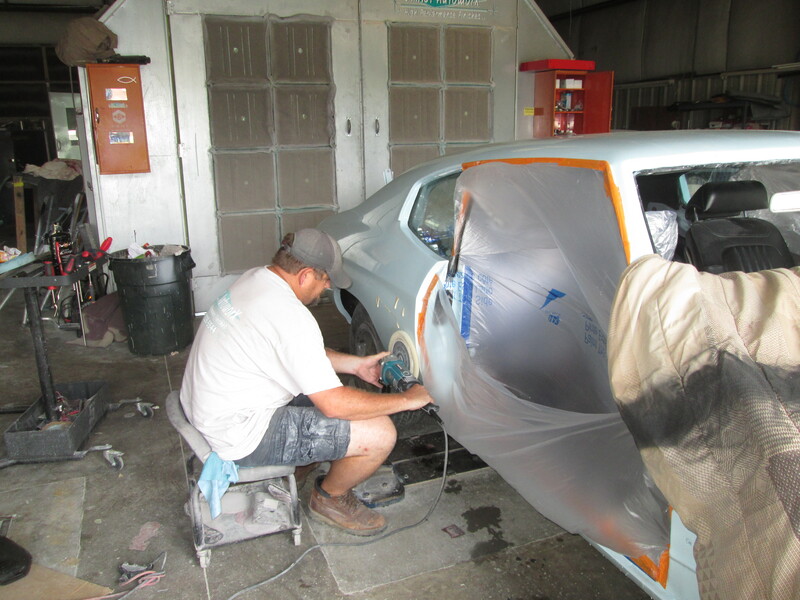 Chris fixed a couple of tiny spots that showed up, then passed it off to Paul for the FINAL primer. While they were working on that, was working on the inside of the right door. 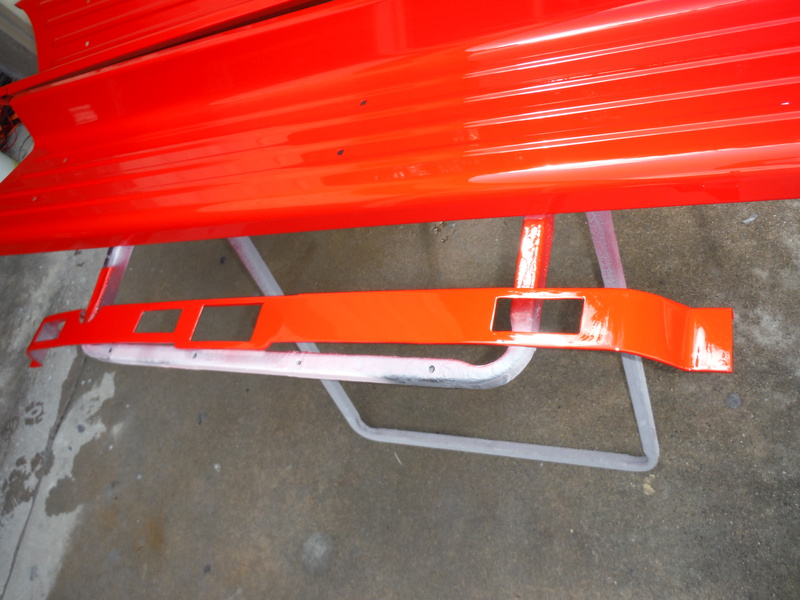 We straightened out the inside where patch panels were welded in and also fixed a few dents and rust pits. The inside of the right door was finished up today, but not in time to get primer on it. Next week we will block the slick sand thats on the outside of the door and prime both sides. 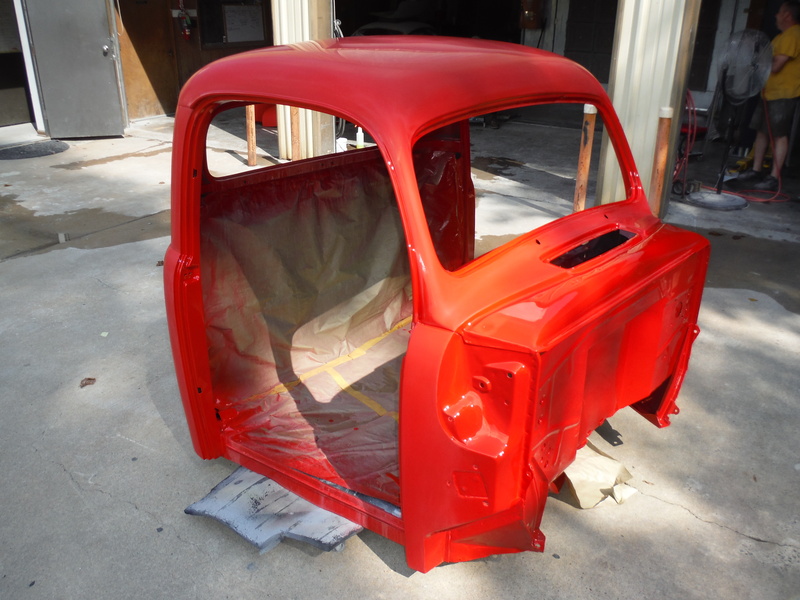 Once this is complete we will prep the hood, both doors and the front valence for paint. 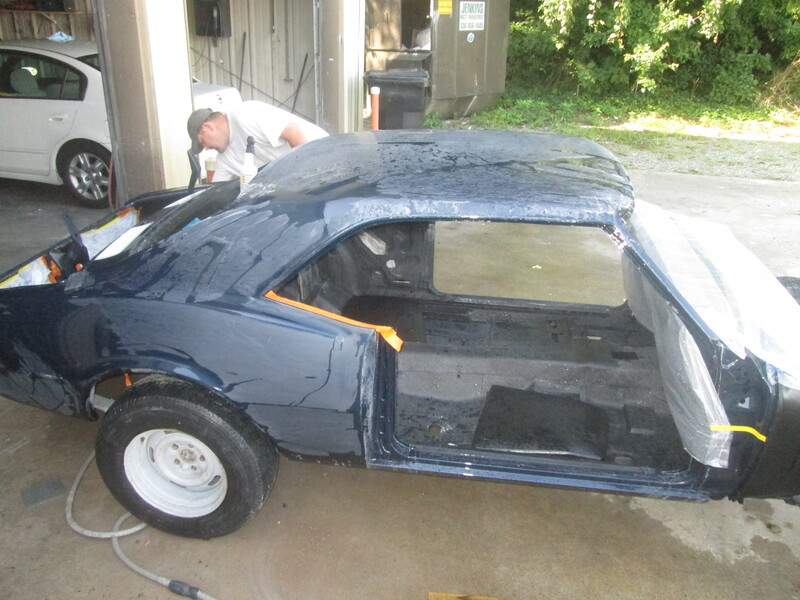 Yesterday and today we wet sanded and buffed the Mustang. We also had time today to start some of the reassembly. When we wet sand we start with 1000 grit paper. This process is to remove any orange peel and/or imperfections in the clear. After the 1000, we switched to 2000 grit paper then we used 3000. 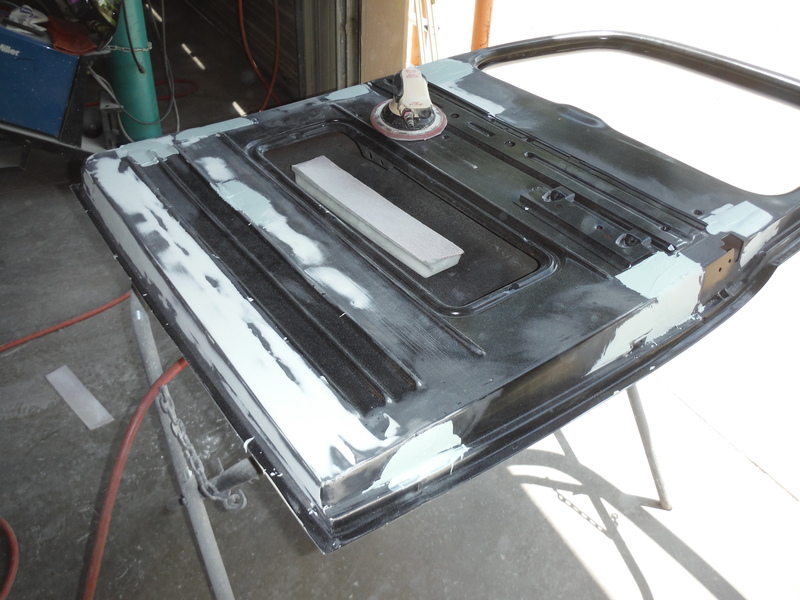 These last two steps are to make buffing easier. When we buff we start with a heavy cutting compound the switch to a lighter cutting compound, followed by a polishing compound. 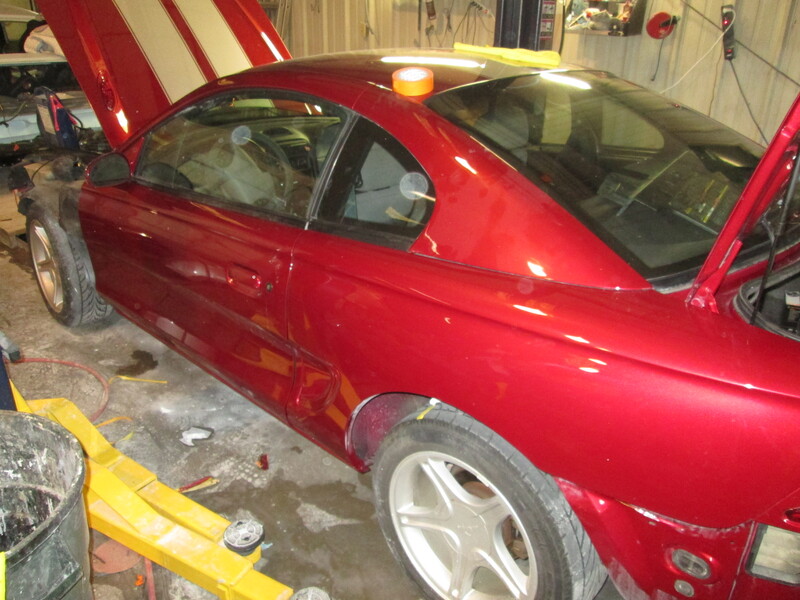 After the buffing was complete we started putting parts back on. 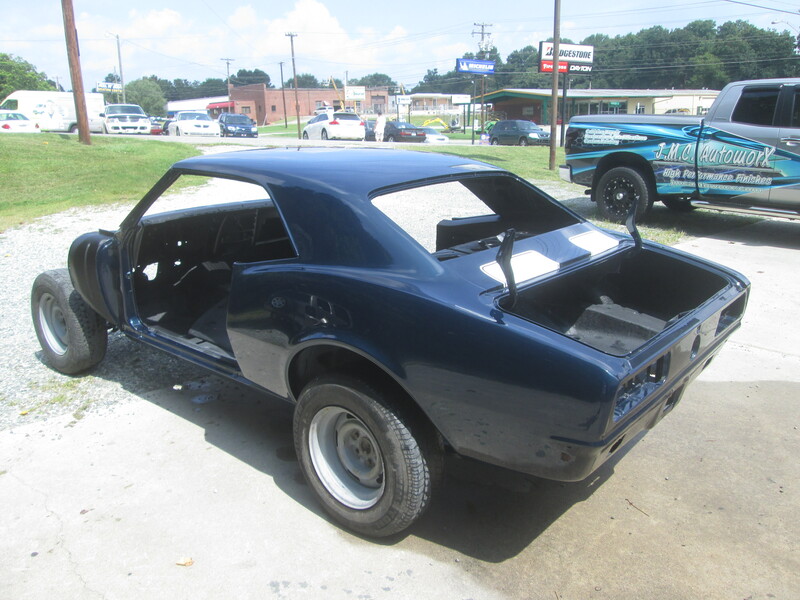 We were able to get the trunk back together, spoiler on, the sail panels on, and the doors all back together. 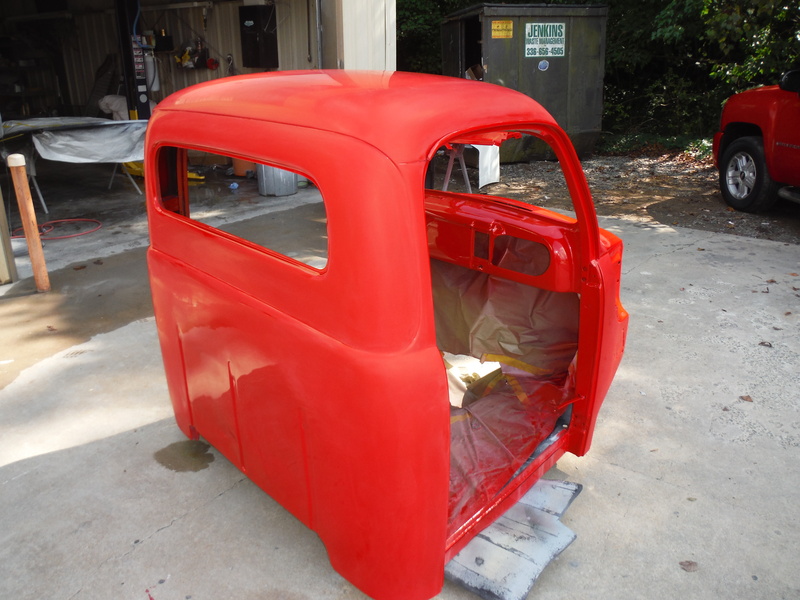 Tomorrow we hope to get the fenders on, bumpers on and the rocker moldings. 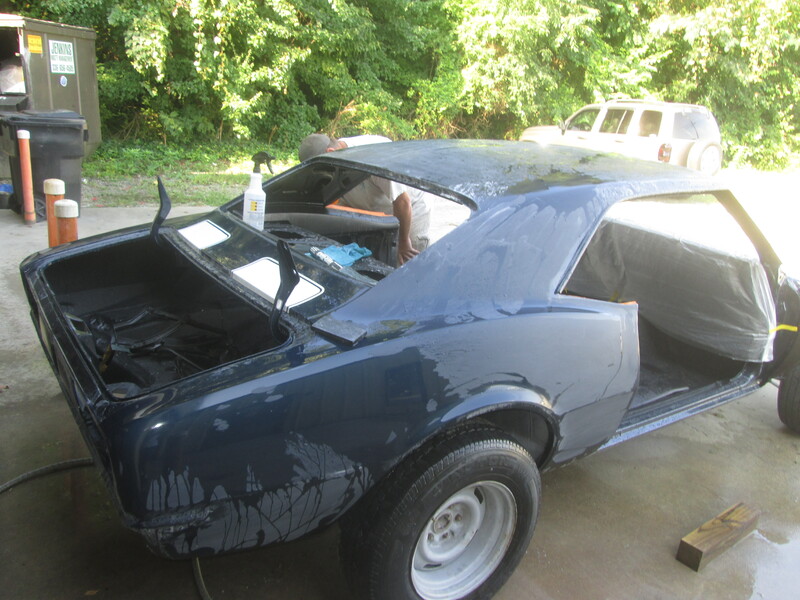 Once that is done, all thats left is to get it all detailed for the owner. Who knows, if the weather cooperates it could be Friday. Phew, what a work out. 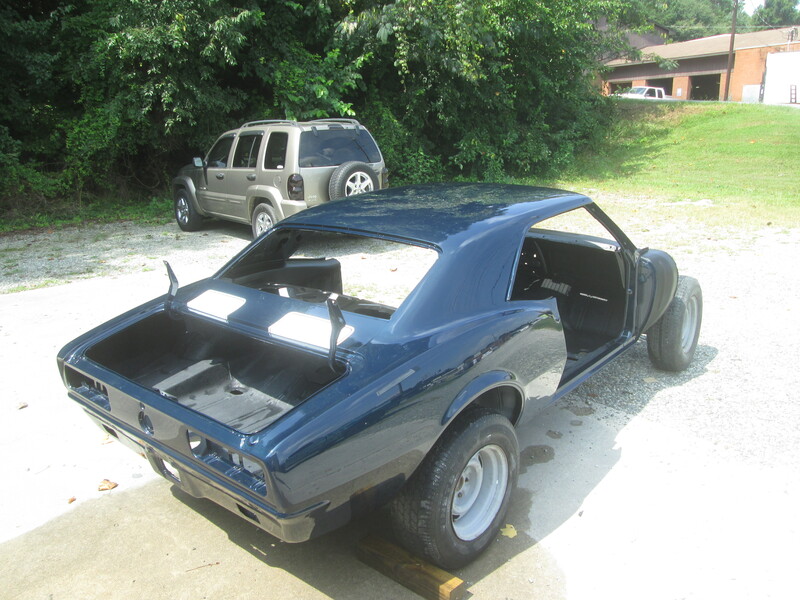 Chris and I started blocking out the body on the Camaro this morning. We used our tried and true 3 step method of 1000 then 2000 then 3000 grit steps. 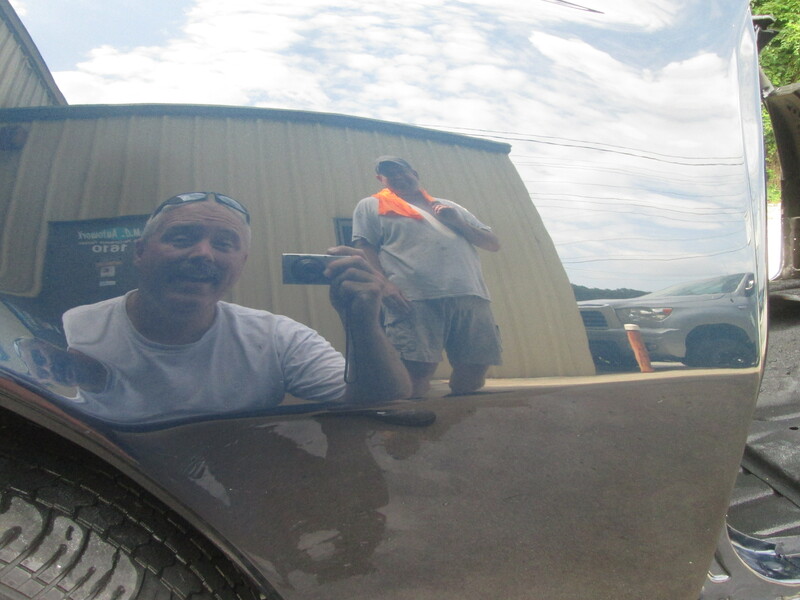 Then we started the buffing process. I know my shoulders will feel it tomorrow. 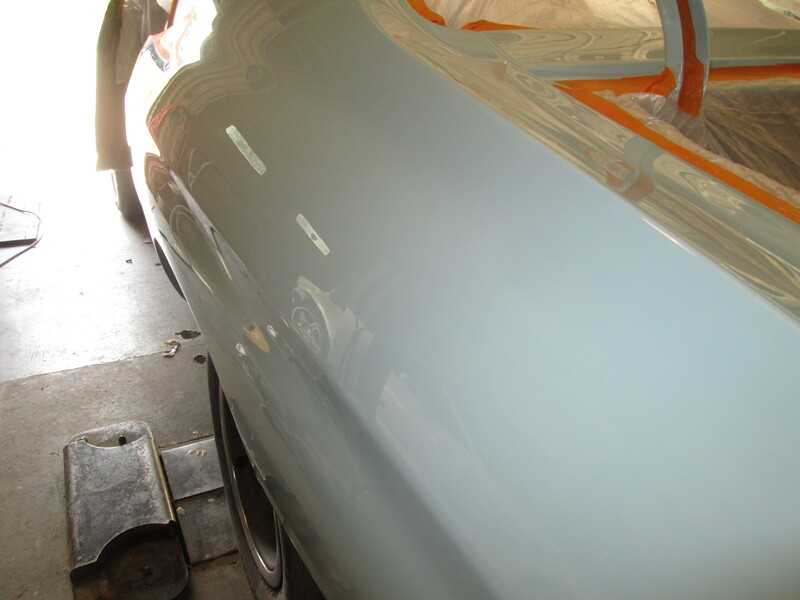 The pictures of the car wet but with dull paint is what the clear looks like after sanding it. The purpose of this step is to remove the orange peel. This is going the extra mile. 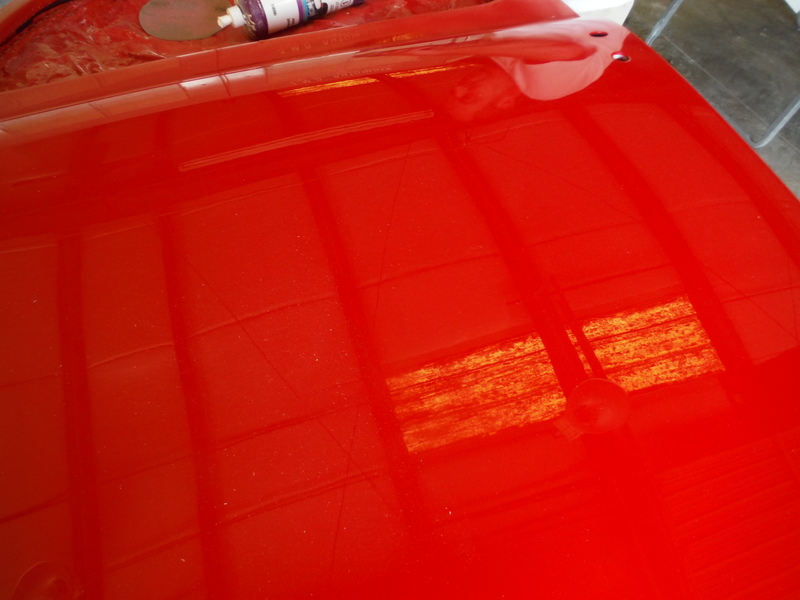 This is what makes paint really shine and POP! You can see this in the picture of the two meat heads in the reflection. Now that this is done its time to start putting it all back together. From here on out, each step will be looking more and more like a car. We did put the bulk head in and installed the dash vents for the a/c. 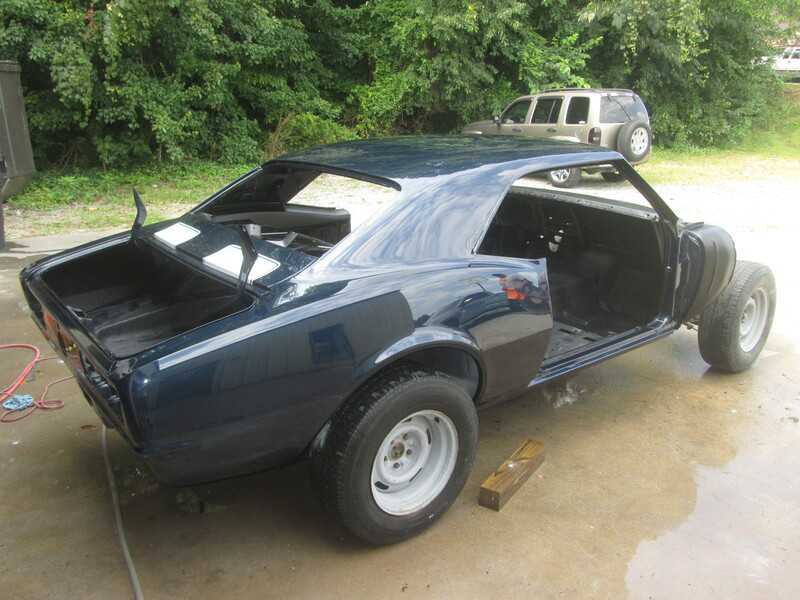 Next week we should have the doors, fenders, trunk, engine installed.